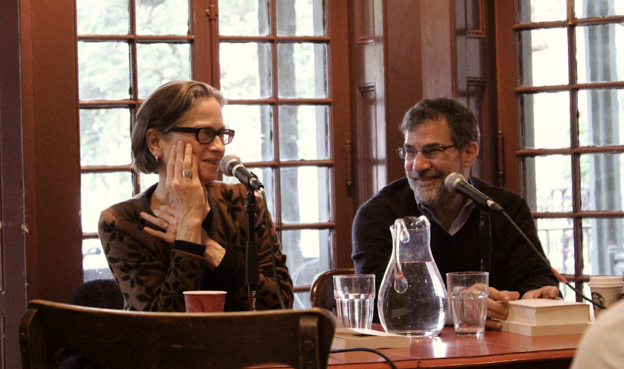 On Tuesday, April 25, I had the honor of interviewing Lydia Davis. She had come to visit the Kelly Writers House as a Writers House Fellow. The program is associated with a seminar that I teach — in which the students and I read as many of the writings of the Fellow as we can. As I discussed Davis’s work with my students and KWH colleagues, I became fascinated by several micro-stories that particularly read like prose poems. “A Mown Lawn” is a series of permutative phrasings that progress from the vowel affinities of “mown” and “lawn” to semantic riffing as well — starting with suburban lawn care, moving through law-and-order conservatism and finally reaching imperialistic warfare. I was compelled by the poem’s radicalization of homonymic improvisation. Naturally, then, when I had a chance to interview its author, I asked her if she would be willing to read it, and comment. She describes this as one of just two explicitly political pieces. Thanks to Andie Davidson, we are now able to present a video clip of that portion of the conversation.